So for this weeks beauty tool Tuesday I'm going to be sharing with you the crème de la crème of eyelash curlers. My ultimate must have in my makeup bag has always been eyelash curlers. Sadly I was born with pretty much straight eyelashes that look limp so I rely on these to give my eye lashes life. 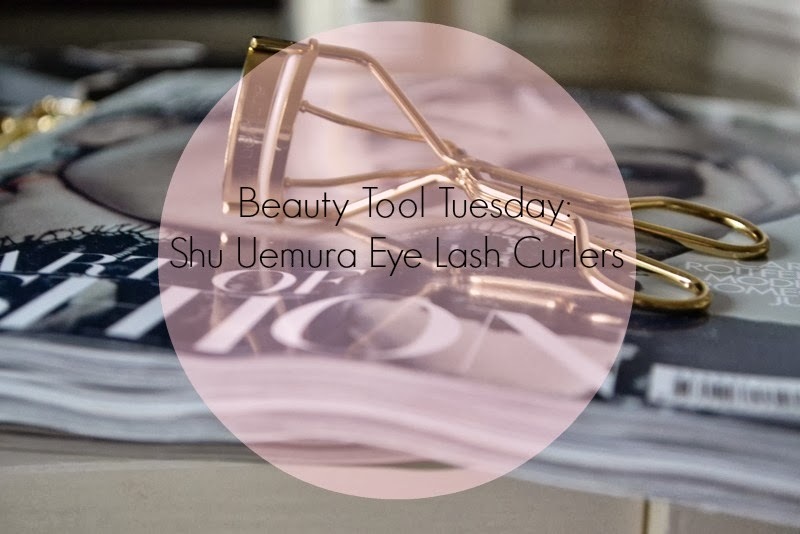 I've had my fair share of eye lash curlers and I thought they were great until I purchased a pair of Shu Uemura curlers that MADE MY LIFE. Ok, slight exaggeration and no need for capitals but they are incredible. These bad boys come in either silver or gold, as I've never owned a gold pair of eyelash curlers I picked them up in gold also I think they look rather cool and different. I brought these curlers around eight months ago from House of Fraser for £20. They may be on the pricy side for eye lash curlers but they are worth every penny. I love curling them and applying one coat of L'Oreal's Telescopic mascara to make my lashes look like they have a natural curl and are lush. Handy Tip: If you want a even curly-er curl then warm your eyelash curlers up with a hair dryer before using them as the heat really effects the lashes. I like doing this on a night out as the curl always seems to last longer when I do so. Though I wouldn't recommend doing it very often as the heat surely isn't very good for the lashes!